Statistical Skier : What Happens To Successful World Junior Racers? What Happens To Successful World Junior Racers? This post appeared on FasterSkier several months ago, but I never posted it here, I don’t think. With World Juniors and U23s wrapping up, it seemed relevant. I edited the text slightly so it will differ somewhat from the original version. These graphs do not include this year’s WJC results or any results from the 2010-2011 season. Identifying talent in endurance athletics at a young age can be a challenging task. My goal here is to give you a sense of what different levels of success at WJC/U23s might indicate and how much variability there is between athletes in this respect. Our basic tool will be a graph of FIS points versus age for distance results, broken down by their best result (finishing place) at WJC/U23s. This gives us a total of eight panels representing the men and women who’s best results were between 1-5, 6-10, etc. If you’re in the 1-5 group, that means your best result at any WJC/U23’s was between 1st and 5th. 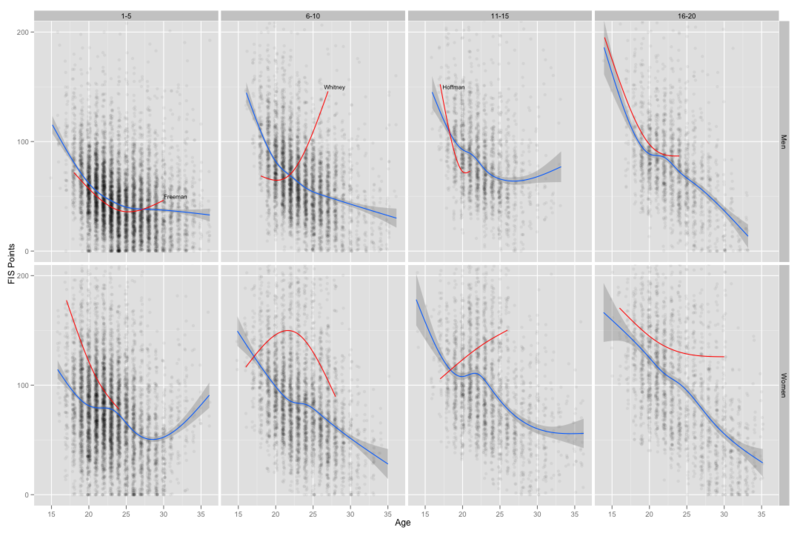 For each group, I’ve plotted their FIS points (in distance races) versus age. Each dot represents one race by one athlete. The blue trend lines are for everyone in that panel. The red lines are for only the American’s in that panel. If an athlete’s name appears next to one of the red lines, that means they are the only American appearing in that panel. Otherwise, the trend lines are averaging over multiple athletes. These graphs are fairly large, so you might want to click on them for a larger version. There’s a lot of interesting stuff going on here. Let’s ignore the Americans for a moment and just look at the blue trend lines. We’d expect the 1-5 group to have the most future success overall, and that is the case. (More dots near the bottom.) As we move right to the 6-10, 11-15 and 16-20 groups the cloud of points mostly creeps upwards, but less so by the time we’re comparing the 11-15 and 16-20 groups, suggesting that there’s a bigger difference between a top 5 and a top 10 than between a top 15 and a top 20 result. We might also expect the trend lines in the groups to flatten sooner and at a higher level as we move rightward. This would correspond to skiers who see less success at WJC/U23s not improving as much or leaving the sport earlier, or both. This kind of happens, but with some weird caveats. The men seem to follow this pattern until we get to the 16-20 group. Why do the 16-20 athletes continue to improve past age 23 where the 11-15 athletes don’t? The answer is likely our old friend, selection bias. Success in ski racing serves as kind of a signaling mechanism as to whether you should continue racing. Skiers who’s top WJC/U23 result is between 16-20 are more likely to stop pursuing an international racing career as their results have signaled that they won’t be successful. The only ones who do continue are the ones who beat the odds and see some measure of success. Another interesting aspect of these data is the evident plateau effect between ages 20-23. Notice how many of the blue trend lines flatten out suddenly at these ages. More so with the women, but we see it in the 11-15 and 16-20 groups for the men as well. What might be causing this? My best guess is that it’s another artifact of selection bias. My guess would be that the ages 20-23 are crucial for deciding whether you’re going to be a successful international ski racer. Athletes steadily improve up to that point and then have a decision to make. Do I continue racing or hang up my skis and go to school, get a job, get married, have kids, etc.? The plateau in the trend lines may come from those athletes that stop improving between those ages. These athletes are likely to stop pursuing a serious racing career (or at least many of them do). The ones who continue are, by necessity, the skiers who end up achieving some measure of success. That’s why we often see this dramatic improvement from ages 16-20, a plateau from 20-23, and then continued improvement from 24 on. It’s important to realize that this doesn’t mean that if you somehow push through ages 20-23 regardless of how much success you’re having, that somehow you’ll magically get faster simply by passing the age of 23. The trend lines simply reflect the individual decisions different athletes are making about their likely future success. I’d guess that a similar plateau effect is happening in the men’s 1-5 and 6-10 panels, but we don’t see it because it’s happening to a much smaller fraction of the athletes, so the trend line isn’t picking it up. Now let’s look at what’s going on with the Americans. Kris Freeman, Rob Whitney and Noah Hoffman are the only Americans in the men’s 1-5, 6-10 and 11-15 panels, respectively. Each of the other red trend lines are based upon multiple athletes. For example, the red trend line in the women’s 1-5 panel is based upon Liz Stephen and Morgan Arritola. The truly bizarre looking red trend line in the women’s 6-10 panel is based upon Kikkan Randall, Nicole DeYong, Taz Mannix and Kristina Trygstad-Saari. Both Randall and DeYong have significantly improved their distance results of late, which accounts for the line bending down suddenly past age 25. Kris Freeman has been more or less “typical” for those athletes achieving a top result at WJC/U23s. Rob Whitney had a very promising beginning, relative to his peers, but encountered some serious difficulties around age 22-23. Noah Hoffman seems to be tracking the trend for his peers, or perhaps a bit better. The most important thing I want to emphasize in these data is how variable they are. Generally speaking, of course, it’s better to have good results (not just at WJCs, all the time!). But if anything, this graph indicates just how crude a predictor WJC/U23s can be for future success on the World Cup. There are plenty of athletes who’ve landed top results at WJCs but haven’t gone on to do much else. Conversely, there are plenty of skiers who never cracked the top 15 at WJCs but ended up having a very long and successful career. There are, as in the rest of life, many different paths to success. Posted by Joran on Tuesday, February 1, 2011, at 6:00 am. Filed under Analysis, WJC/U23. 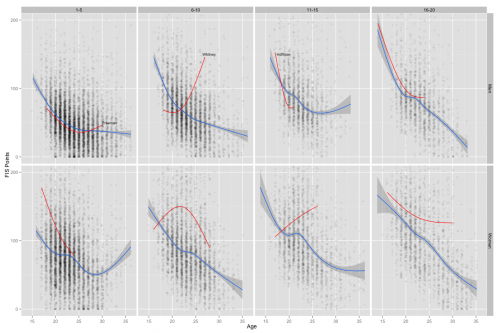 Tagged Age, Analysis, Distance, selection bias, U23, US Skiing, WJC/U23. Follow any responses to this post with its comments RSS feed. You can post a comment, but trackbacks are closed.